“Who are we as architects?” we found ourselves pondering, across a half-a-ton bright orange robotic arm looming over the very little space we have as our digital fabrication workshop. We were not the run-of-the-mill modernist architect with orthogonal edges nor the blob1 lover parametric designer drooling over geometries without a clue on how to fabricate them. Computational design certainly did not mean tweaking some parameters in a script found online just to get another cheap variation of a waffle structure, triangulated mesh, or most sinful of all – a voronoi2 based geometry. helloWorld.3 This is first issue of our modest monthly corner where we delve into all things related to computational design and digital fabrication. We will start with the evolution of the architect throughout the time, providing a brief overview divided in three parts which will be later expanded upon in the following issues. Without further ado, let us return to the introspection of the profession for us to understand who we are. 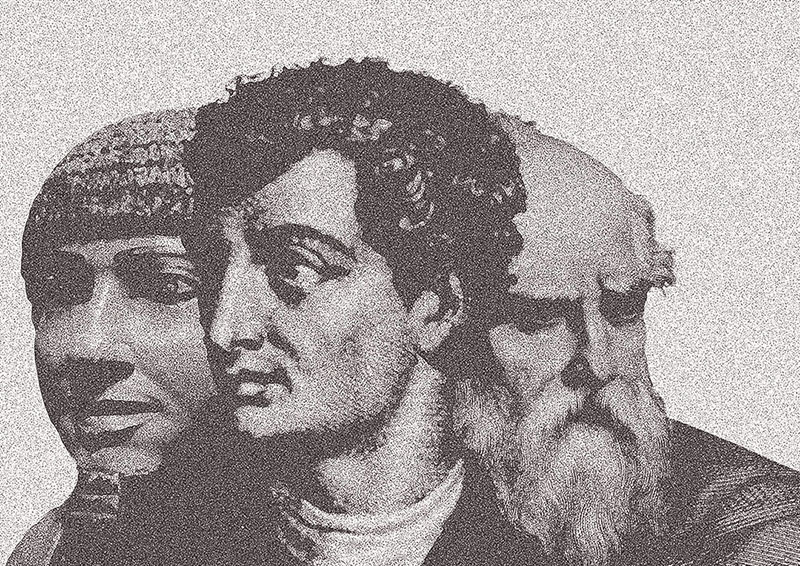 Imhotep, Alberti and Vitruvius. All in one! Collage by Efe Gözen, 2017. So, how did a “chief carpenter” who is a hands-on artisan in the field, all of a sudden transcend from its initial role to become a supervisor with specialized knowledge, eventually transforming into a synonym for the creative director of any work? What qualities did we lose or gain in the process? Enter Alvin Toffler, an American futurist writer who is well recognized for his analysis of technology and its impact on society. Introduced most distinctly in The Third Wave (1980), Toffler argues that the changes in production systems in the history of mankind have caused paradigm shifts, affecting societies of their time. Naming these paradigm shifts as “waves”, Toffler states that the ways people think, speak, work, live as well as their set of values, and morals have altered with each wave.4 The profession of architecture and architect as the professional were also subject to change. First Wave is the shift which replaced hunter-gatherers with agrarian society after the Neolithic Revolution, whereas the Second Wave was triggered with the Industrial Revolution that rapidly transformed people into Industrial Age society. Third Wave is the post-industrial society, a transitional period we are currently going through that can be dubbed as the Information Age. First Wave brought the emergence of Arkhitekton, the chief carpenter. Early builders were self-taught and first examples of architecture were houses to address the basic need for shelter. Examples of vernacular architecture still falls under this category, however we will not be focusing on this phenomena. It was another housing project that proved challenging for the first builders, housing for deities – a concept which was instrumental and primordial in settling cities. Highest representative of divine authority which meant rulers or priests, on behalf of divine beings, were commissioned to construct these houses. Although the task required specialized knowledge, in the beginning architecture was an identity part of the multi-disciplinary innovator of the ancient times, such in the case of Imhotep – the architect of the Pyramid of Djoser who was also a scribe, an astronomer, magician and healer.5 Training of the architect in Ancient Egypt was closely tied to the priest class, and knowledge was passed on from generation to another. 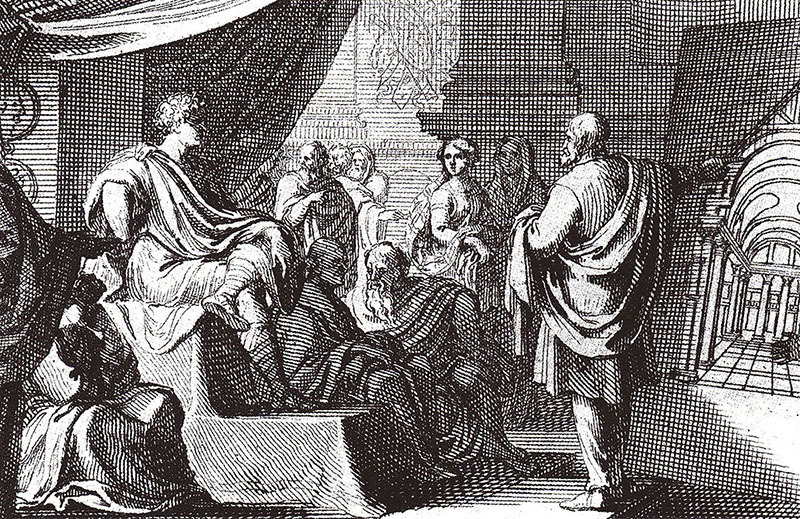 Vitruvius pitching his vision to Augustus. Engraving by Sébastien Leclerc, 1684. Need for an organizational body for construction surged only as the need for public works increased in Ancient Greece and Roman times. With the formation of collegiums in Roman period, builders were represented under one body. Vitruvius argued that guild training would not be enough for the master builder as it required studying the theory of making building which was just as important. Ten Books of Architecture by Vitruvius marked the first documented attempt to transform the profession into a specialized designer. The pursuit of distinction was derived from the impetus of architects growing their client base to supervise the construction of the private villas of elite families, which empowered the architect’s status amongst other building professions. Formation of guilds in the Medieval Age was a natural extension of collegiums, and further established an inter-professional contact for all artisans, whom we would classify separately as architects, engineers, carpenters and builders in modern times; yet, they were part of the same guild since the line between each profession was blurred and every actor bore parts each profession. Even though the way of worship had altered, religion emerged to be the dominant force of the era. Church had greater powers, one that often exceeded the king’s, and replaced the city commission and the rulers as the client. Every creative activity was attributed to God, and the position of the architect demoted to be merely an overseer amongst the many guild members employed by the Church. After all, God is the creator. 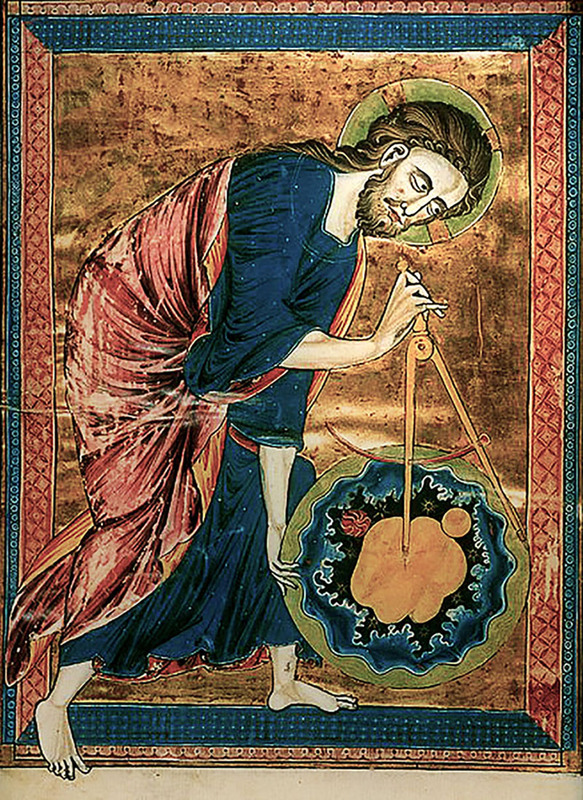 God, the Architect of the Universe by Anonymous (c 1220-1230). It was only with the dawn of Renaissance, the empowering of man – that the architect could recover its position and reinstate its role as the creator. Renaissance was a breaking point between the First and the Second Wave. As mercantilism emerged, it offered an alternative to the agrarian way of living for an exclusive minority. Although not a production system, it accumulated the necessary wealth for the entrepreneurs in the Second Wave and accelerated the transition between waves. With the arrival of the Renaissance, architect‘s role would be redefined in a way that has closer ties with the definition of architect of today. Architecture was not a recognized as a separate profession until the Renaissance, and only from then on it would have its clearly defined place within the trades.6 Architects would become to be known as the professionals bearing the set of professional and social relationships that would have contact with the patron, the workmen, the administrator and officials of the building program; further separating the architect from the mason and the carpenter, trying to make a social distinction by striving to further present himself as the practitioner of a Liberal Arts.7 Church would also change their way of employing architects as part of guilds, as they rather started employing architects directly based on their skills. As a result of the flourishing bourgeois class and their keen desire to accentuate their wealth, architects’ client base would grow again to cover private commissions. Guild members working long hours. Predella relief underneath the Four Crowned Saints by Nanni di Banco, 1410-1412. Alberti was a pioneer in redefining the role of the architect. Building upon Vitruvius‘s method for studying architecture, his ideal of architectural harmony required architect to be responsible for every part of his building; architect was a designer, but he did not necessarily had to have a role in the construction phase implying a duality in the nature of design realization. He made a clear distinction between the architect and the builders, assigning their respective roles in the design and construction phases of a building. For Alberti, architect was free to design for any building material and to use any technical device that would make his building stand – an approach beyond its time which resonates with the technological advances of today, which we will discuss further in upcoming issues. We are closing in on the architect, but only at one third of the way. Wonder what the industrial revolution will bring. Blob-Architecture, coined by Greg Lynn in 1995 to express freeform geometries he investigated using metaballs. a great mathematical diagram useful in many fields of engineering for optimized representations, and the worst possible concept in architecture. first lines of codes taught in every computer language to grasp the syntax. Toffler, A. (1980). The Third Wave. New York: Collins. Kostof, S. (1977). The Practice of Architecture in Ancient World: Egypt and Greece. In S. Kostof, The Architect Chapters in the History of the Profession. New York: Oxford Univsity Press. Ettlinger, L. D. (1977). The Emergence of the Italian Architect during the Fifteenth Century. In S. Kostof, The Architect – Chapters in the History of the Profession (p. 96). New York: Oxford University Press. Wilkonson, C. (1977). The New Professionalism in the Renaissance. In S. Kostof, The Architect – Chapters in the Profession. New York: Oxford University Press.